Los Angeles Kings goalie Jonathan Quick gives up a goal by Chicago Blackhawks center Michal Handzus as the Blackhawks defeated the Kings 5-4 in the second overtime period in Game 5 of the Western Conference finals Wednesday night. 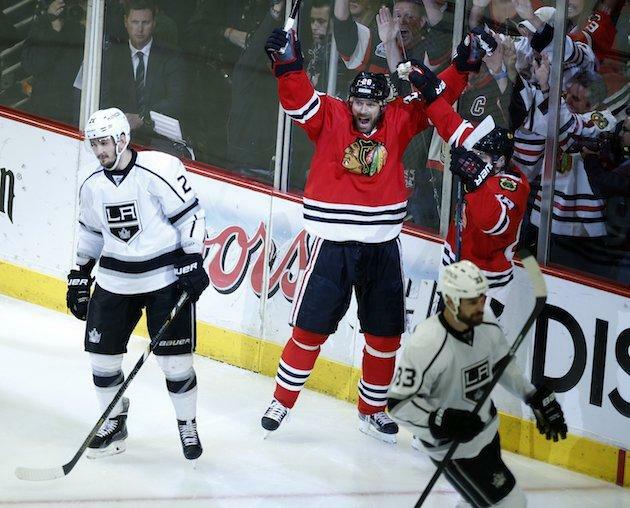 Living to fight another day, the Chicago Blackhawks almost had to actually play into that next day by defeating the Los Angeles Kings 5-4 in double overtime Wednesday night, keeping their season alive in this challenging Western Conference Finals. The Hawks came out charged up and their energy helped force a key penalty on Kings defenseman Drew Doughty for tripping Jonathan Toews, which led to the first goal of the game courtesy of Brent Seabrook on the power play just over a minute into the first period to put the home team up 1-0. Chicago’s early charge didn’t stop there as defenseman Johnny Oduya drove hard to the net after a Patrick Kane shot, netting home his second goal of the playoffs off a wrist shot (3:40) and extending the lead to 2-0. The Kings finally woke up when Jarret Stoll scrambled in front of the net and scored at 9:49 to cut the Hawks lead in half 2-1. The Hawks responded just under two minutes later when Brandon Saad tallied his fifth goal of the playoffs (11:06), extending the lead to 3-1 but there was so much more to come. L.A. countered once again courtesy of Marian Gaborik, who scored his 11th goal of the playoffs at 13:16, creating a 3-2 score at the end of a busy first 20 minutes. Both teams suffered some give and take in the first period, but the Kings carried their momentum into the second period and wound up tying the game with Dustin Brown hitting the net at 11:08 to make the score 3-3. Tanner Pearson, part of the newly christened “That 70’s Line,” delivered a slap shot past Hawks goalie Corey Crawford exactly two minutes later (13:08), giving the Kings a 4-3 lead it would carry after two periods. L.A. clearly outplayed the Hawks in the second 20 minutes, dominating the shots on goal category with a 16-11 advantage. The sold out crowd at the United Center was at a standstill and the Hawks were 20 minutes away from planning their summer vacation, but they would not go out quietly. Michal Handzus (center) celebrates his game-winning goal in Game 5. The 3rd period saw the Hawks play much sharper and soon coming out of that play was Ben Smith’s game-tying goal at 1:17, making it a 4-4 game. Hawks-manufactured pressure helped them dominate the third period offensively with a 16-8 advantage on shots on goal as the game extended into overtime. There’s certainly nothing like overtime in the Stanley Cup Playoffs, for this one a season was on the line and that desperation helped motor a great first overtime, filled with meaningful scoring chances for both teams but nothing came about. One particular period of nonstop action lasted seven minutes and included nine stoppages. As expected, fatigue became a factor for both teams, but as the second overtime commenced, it didn’t take long for a hero to be cast and playing the role was 17-year veteran Michal Handzus. The Hawks’ forward scored the game-winner off a backhand shot (2:04) that sailed just over the glove of Kings goalie Jonathan Quick. Outside of a tough second period, Hawks goalie Corey Crawford played well in keeping his team in this elimination struggle, establishing himself fully in the very active first overtime and stopping 40 of 44 shots overall, good for a .909 save percentage. Quick survived a tough first period for the Kings and played solid, but someone had to take the loss. In the end, Quick also collected 40 saves while posting a save percentage of .889. CHI — Patrick Kane with a game-high 4 assists. CHI — Andrew Shaw scored 2 assists. CHI — Andrew Shaw and Bryan Bickell each had 8 hits. CHI — Ben Smith lead the team with 4 blocked shots. CHI — Marcus Kruger lead the team in faceoff percentage (60%). CHI — Brandon Saad scored 3 points (1 goal, 2 assists). LA — Jeff Carter scored 1 assist. LA — Mike Richards and Dwight King each had 1 assist. LA — Dustin Brown lead the team in hits (8). LA — Drew Doughty, Slava Voynov and Alec Martinez tied for the team in blocked shots (4). LA — Went 0-3 on the power play. LA — Suffered its first loss after going 8-0 when leading after two periods. CHI — Patrick Sharp, Duncan Keith and Marian Hossa combined for 0 points. After an exciting finish in double overtime to keep their season alive, the Hawks have gained a significant bit of momentum heading to Los Angeles for Game 6 on Friday. The Kings had their chances to close out the defending champs, especially after blowing a 4-3 lead in the second period, and though they still lead the series and they’ve played well against Chicago at home, the pressure is still on them, they have to prove that they can close out the defending champs — a position that the Hawks succeeded in when roles were reversed in last year’s playoffs. The Hawks must continue their momentum from Game 5 with a strong start on the road in Game 6 and take the sellout crowd out of the game early while the Kings must play a better defensive game after collapsing late in the third period and in the overtimes while also scoring fast and early like in Game 4. If L.A. does come out hot, defensively the Hawks can find inspiration in their overtime play from Game 5 and use their speed to set the pace for the contest. Will the Hawks finally win in LA to force a Game 7 back in Chicago? Will the Kings take advantage of their home crowd in the Staples Center and make good on their best chance to knock out the champs? We’ll find out Friday night.